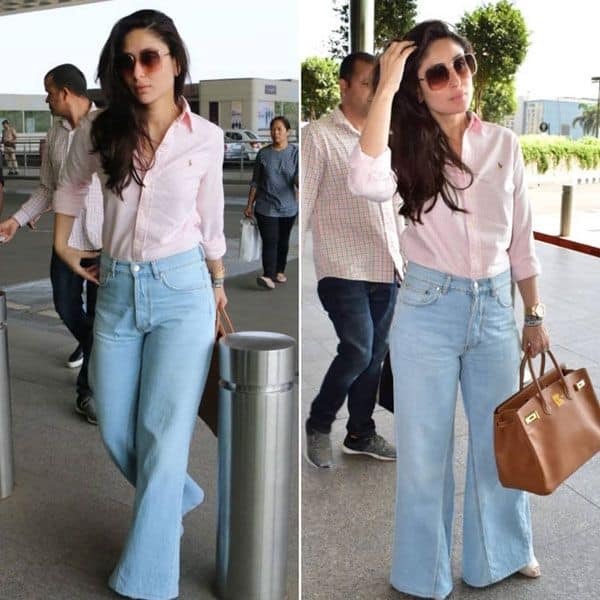 The Begum of Pataudi headed to the airport dressed in bell-bottom jeans, baby pink shirt and taupe heels. A solid gold wristwatch, glares and a brown tote bag were her choices of accessories. She left us crushing on her the perfect fall of her hair and wonderfully put together look. She has been promoting Kalank extensively in Indian wear. Colourful/white anarkalis, huge jhumkas and jootis have been the mainstays of her looks for the promotions. We totally loved the maroon printed dress on Alia. It is from Sabyasachi’s newly launched Kashgar Bazaar collection. The dress with those gold earrings looked fabulous. The actress was taping for an episode of Super Dancer with yesteryear divas Waheeda Rehman and Asha Parekh. She wore a white organza saree with hand-painted flowers. It was from Picchika. The jewellery was from Amrapali and Roopa Vohra. Stylist Sanjana Batra put the vintage look together. Yellow has been quite a fave colour with celebs this red carpet season. Malaika Arora Khan absolutely rocked this Iris Serban gown with her lovely bronzed look. A bright red lip and golden heels finished off the outfit. Mimi Cuttrell again curated a fab look for Priyanka Chopra. The outfit had sophistication written all over it. We so love the studded transparent heels. These beautiful women surely gave us fashion goals this week. Tell us which look you loved with your comments!